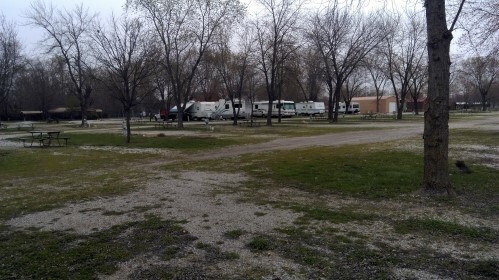 This was our camp at the Granite City KOA. 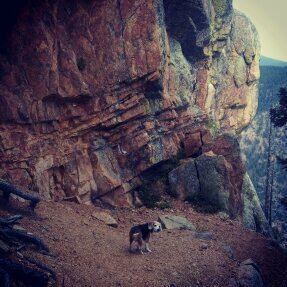 Located right off Route 66. They gave us a nice spot in the back of the park. There was a field behind us that we were able to walk the dogs in unleashed (always a bonus!) 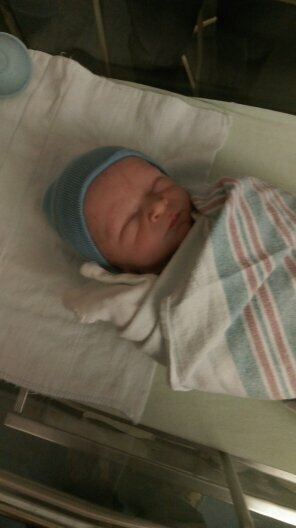 As you can see in the picture, we were able to set up our exterior room for the first time. What an awesome investment! Tripled our available space, made an office and a yoga room all in a matter of minutes. This is an overview shot of the park. You can see the shower building on the left. 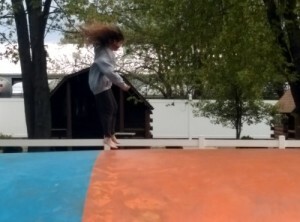 The park was nice enough. Clean, the staff folks were all real nice. The showers were maintained (expect built for short people) and cleaned daily. It is an odd location around the park. It is in a commercial area and surrounded by commercial buildings, large metal warehouse type things. Semi’s run in and out all day and sometimes at night. 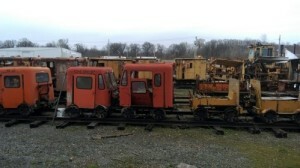 There was a salvage yard of these little guys directly behind our camp site. 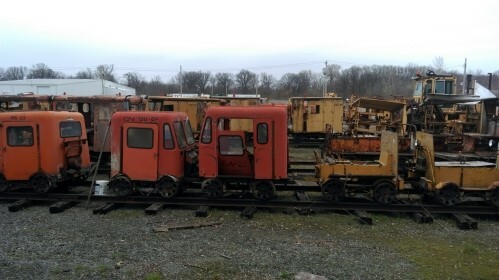 They are maintenance vehicles from the railroad days gone by. Apparently folks buy them and turn them into railed race cars now. They have 4 cylinder and 2 cylinder engines in them. It rained a lot while we were in the St Louis area. This presented the same sort of issues it would anywhere else. Tie downs for the awning – good ones as the winds were nothing to take lightly. Items placed up off the ground in the flood areas, those types of things had to be done and maintained, else things could go wrong quickly. 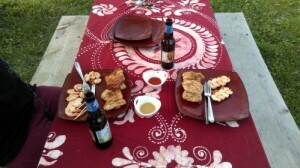 We did manage to enjoy some surf & turf (chicken & shrimp) on one of the sunny days! It was nice to sit out at the picnic table and eat diner, We had a great spot in th e park to watch all the comings and goings while we ate. 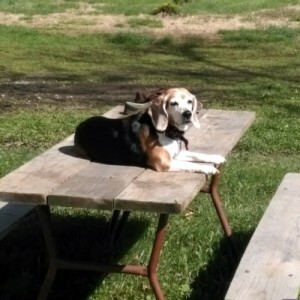 When not is use as a dinner table, the picnic table was The Beagles spot of choice to survey her new kingdom. 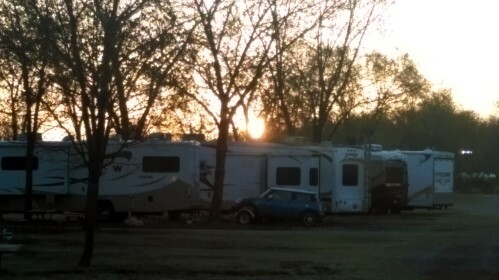 The park offers cabins and tent spaces in addition to RV full hook ups. They have many drive thru spots available as well as back ins. We enjoyed our stay at this park. It’s location was central to all the things we wanted to see and do in the area. We’d stay again and do recommend it as a decent place to stay for a while, assuming you don’t mind the occasional noise. 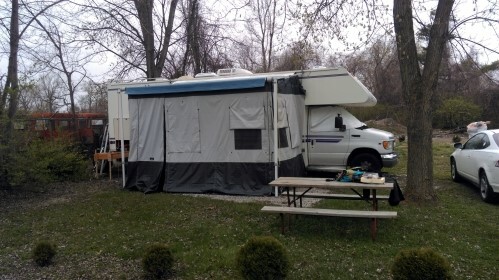 This entry was posted in Destinations, Illinois, Missouri, RV Parks. Bookmark the permalink.